Empire SUITE is pleased to announce that it has been selected by Insight Success as a top ten best performing professional service automation (PSA) solution provider for 2017. “Upon review of the 2017 nominees, WSG’s Empire SUITE stood out due to its quick deployment time and ease of operation,” commented Pooja M. Bansal, Editor-in-Chief of Insight Success. 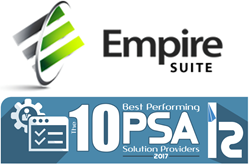 Empire SUITE is pleased to announce it has been selected by Insight Success as a top ten best performing professional service automation (PSA) solution provider for 2017. With Empire SUITE project and resource management software, users can quickly and efficiently improve project and program management success by substantially streamlining management processes, keeping projects on-track and on-budget and alerting managers to potential overages before the overrun occurs while it’s possible to make the necessary changes. A summary article about the winning company’s philosophy, history and solutions can be found online here. Highlights include Hammering the Nails of Success to Build an Empire, Watching for Opportunities, Focusing on the Outcome, Not the Obstacle, Standing Out from the Crowd Instead of Standing Among the Crowd and Embracing Industry Changes. WSG’s award-winning Empire SUITE enterprise resource software is fast becoming the go-to set of tools to help instill financial discipline in support of resource management and project success. It also complements the world’s most popular software packages from companies such as Microsoft, Wolters Kluwer, Deltek, SAP and Oracle, with integrated easy-to-use tools to make some of today’s most complex and costly business project management tasks easier and more efficient. Major organizations around the globe have deployed Empire SUITE and are reaping the cost, operational and efficiency benefits from enhanced project and resource management. Empire SUITE focuses on project and resource management from a financial perspective, allowing management to track project time, budget and resources in real-time. From accounting to HR to IT to finance, virtually every department in the enterprise will benefit from the features offered to streamline operations, and employees appreciate the user-friendly interface and mobile access for on-the-go data input. For more information, please visit the Empire SUITE product page on the company’s website or contact us at info@wsg.com or via phone at +1.212.675.2500.